Under the existing regime, long term capital gains arising from transfer of long term capital assets, being equity shares of a company or a unit of equity oriented fund or a unit of business trust, is exempt from income-tax under clause (38) of section 10 of the Act. However, transactions in such long-term capital assets are liable to securities transaction tax (STT). Consequently, this regime is inherently biased against manufacturing and has encouraged diversion of investment to financial assets. It has also led to significant erosion in the tax base resulting in revenue loss. The problem has been further compounded by abusive use of tax arbitrage opportunities created by these exemptions. In order to minimize economic distortions and curb erosion of tax base, it is proposed to withdraw the exemption under clause (38) of section 10 and to introduce a new section 112A in the Income-tax Act, 1961 (‘the Act’) vide clause 31 of the Finance Bill, 2018 so as to provide that long-term capital gains arising from transfer of such long-term capital asset exceeding one lakh rupees will be taxed at a concessional rate of 10 percent. 2. In order to minimise economic distortions and curb erosion of tax base, it is proposed to withdraw the exemption under clause (38) of section 10 and to introduce a new section 112A in the Income-tax Act, 1961 (‘the Act’) vide clause 31 of the Finance Bill, 2018 so as to provide that long-term capital gains arising from transfer of such long-term capital asset exceeding one lakh rupees will be taxed at a concessional rate of 10 percent. 3. 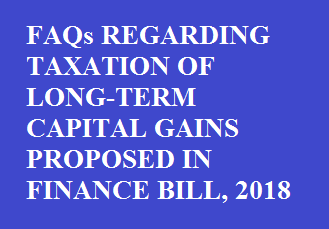 Since the introduction of the Finance Bill, 2018 on 1st February, 2018, several queries have been raised in different fora on various issues relating to the proposed new tax regime for taxation of long-term capital gains. The responses to these queries are provided below. Q 1. What is the meaning of long term capital gains under the new tax regime for long term capital gains? iii. Unit of a business trust. b. the Securities Transaction Tax (STT) is paid at the time of transfer. However, in the case of equity shares acquired after 1.10.2004, STT is required to be paid even at the time of acquisition (subject to notified exemptions). Q 2. What are the modes of acquisition of equity shares which are proposed to be exempted from the condition of payment of STT? Ans 2. The Central Government had exempted certain modes of acquisition of equity shares for the purposes of clause (38) of section 10 of the Act vide notification no. 43/2017 dated 5th of June, 2017. This notification is proposed to be reiterated for the purposes of clause 31 of the Finance Bill, 2018 after its enactment. Q 3. What is the point of chargeability of the tax? Ans 3. The tax will be levied only upon transfer of the long-term capital asset on or after 1st April, 2018, as defined in clause (47) of section 2 of the Act. Q 4. What is the method for calculation of long-term capital gains? Ans 4. The long-term capital gains will be computed by deducting the cost of acquisition from the full value of consideration on transfer of the long-term capital asset. Q 5. How do we determine the cost of acquisition for assets acquired on or before 31st January, 2018? Ans 5. The cost of acquisition for the long-term capital asset acquired on or before 31st of January, 2018 will be the actual cost. However, if the actual cost is less than the fair market value of such asset as on 31st of January, 2018, the fair market value will be deemed to be the cost of acquisition. Further, if the full value of consideration on transfer is less than the fair market value, then such full value of consideration or the actual cost, whichever is higher, will be deemed to be the cost of acquisition. Q 6. How will the fair market value be determined? Ans 6. In case of a listed equity share or unit, the fair market value means the highest price of such share or unit quoted on a recognized stock exchange on 31st of January, 2018. However, if there is no trading on 31st January, 2018, the fair market value will be the highest price quoted on a date immediately preceding 31st of January, 2018, on which it has been traded. In the case of unlisted unit, the net asset value of such unit on 31st of January, 2018 will be the fair market value. Q 7. Please provide illustrations for computing long-term capital gains in different scenarios, in the light of answers to questions 5 and 6. Scenario 1 – An equity share is acquired on 1st of January, 2017 at Rs. 100, its fair market value is Rs. 200 on 31st of January, 2018 and it is sold on 1st of April, 2018 at Rs. 250. As the actual cost of acquisition is less than the fair market value as on 31st of January, 2018, the fair market value of Rs. 200 will be taken as the cost of acquisition and the long-term capital gain will be Rs. 50 (Rs. 250 – Rs. 200). Scenario 2 – An equity share is acquired on 1st of January, 2017 at Rs. 100, its fair market value is Rs. 200 on 31st of January, 2018 and it is sold on 1st of April, 2018 at Rs. 150. In this case, the actual cost of acquisition is less than the fair market value as on 31st of January, 2018. However, the sale value is also less than the fair market value as on 31st of January, 2018. Accordingly, the sale value of Rs. 150 will be taken as the cost of acquisition and the long-term capital gain will be NIL (Rs. 150 – Rs. 150). Scenario 3 – An equity share is acquired on 1st of January, 2017 at Rs. 100, its fair market value is Rs. 50 on 31st of January, 2018 and it is sold on 1st of April, 2018 at Rs. 150. In this case, the fair market value as on 31st of January, 2018 is less than the actual cost of acquisition, and therefore, the actual cost of Rs. 100 will be taken as actual cost of acquisition and the long-term capital gain will be Rs. 50 (Rs. 150 – Rs. 100). Scenario 4 – An equity share is acquired on 1st of January, 2017 at Rs. 100, its fair market value is Rs. 200 on 31st of January, 2018 and it is sold on 1st of April, 2018 at Rs. 50. In this case, the actual cost of acquisition is less than the fair market value as on 31st January, 2018. The sale value is less than the fair market value as on 31st of January, 2018 and also the actual cost of acquisition. Therefore, the actual cost of Rs. 100 will be taken as the cost of acquisition in this case. Hence, the long-term capital loss will be Rs. 50 (Rs. 50 – Rs. 100) in this case. Q 8. Whether the cost of acquisition will be inflation indexed? Ans 8. 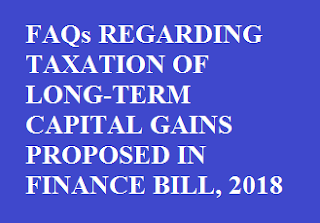 Sub-clause (5) of clause 31 of the Finance Bill, 2018, inter alia, provides that the long-term capital gain will be computed without giving effect to the provisions of the second provisos of section 48. Accordingly, it is clarified that the benefit of inflation indexation of the cost of acquisition would not be available for computing long-term capital gains under the new tax regime. Q 9. What is the date of commencement of the proposed new tax regime? Ans 9. The proposed new tax regime will apply to transfer made on or after 1st April, 2018. The existing regime providing exemption under clause (38) of section 10 of the Act will continue to be available for transfer made on or before 31st March, 2018. Q 10. What will be the tax treatment of accrued gains upto 31st January 2018? Ans 10. As the fair market value on 31st January, 2018 will be taken as cost of acquisition (except in some typical situations explained in Ans 7. ), the gains accrued upto 31st January, 2018 will continue to be exempt. Q 11. What will be the tax treatment of transfer of share or unit between 1st February 2018 to 31st March 2018? Ans 11. As replied in answer 9, the new tax regime will be applicable to transfer made on or after 1st April, 2018, the transfer made between 1st February, 2018 and 31st March, 2018 will be eligible for exemption under clause (38) of section 10 of the Act. Q 12. What will be the tax treatment of transfer made on or after 1st April 2018? Ans 12. The long-term capital gains exceeding Rs. 1 Lakh arising from transfer of these asset made on after 1st April, 2018 will be taxed at 10 per cent. However, there will be no tax on gains accrued upto 31st January, 2018 as explained in Ans 10. Q13. What is the date from which the holding period will be counted? Ans 13. The holding period will be counted from the date of acquisition. Q 14. Whether tax will be deducted at source in case of gains by resident tax payer? Ans 14. No. There will be no deduction of tax at source from the payment of long-term capital gains to a resident tax payer. Q 15. Whether tax will be deducted at source in case of payment of long-term capital gains by non-resident tax payer (other than a Foreign Institutional Investor)? Ans 15. Ordinarily, under section 195 of the Act, tax is required to be deducted on payments made to non-residents, at the rates prescribed in Part-II of the First Schedule to the Finance Act. The rate of deduction in the case of capital gains is also provided therein. In terms of the said provisions, tax at the rate of 10 per cent will be deducted from payment of long-term capital gains to a non-resident tax payer (other than a Foreign Institutional Investor). The capital gains will be required to be computed in accordance with clause 31 of the Finance Bill, 2018. Q 16. Whether tax will be deducted at source in case of payment of long-term capital gains by Foreign Institutional Investors (FIIs)? Ans 16. No. There will be no deduction of tax at source from payment of long-term capital gains to a Foreign Institutional Investor in view of the provisions of sub-section (2) of section 196D of the Act. Q17. How will the gains in the case of FIIs be determined? Ans 17. The long-term capital gains in case of FIIs will be determined in the same manner as explained in earlier answers in the case of resident tax payers. Q 18. What will be the treatment of the gains accrued upto 31st January 2018 in the case of FIIs? Ans 18. In case of FIIs also, there will be no tax on gains accrued upto 31st January, 2018 as explained in Ans 10. Q 19. What will be the tax treatment of transfer of share or unit between 1st February 2018 to 31st March 2018 in the case of FIIs? Ans 19. As explained in Ans 11, in case of FIIs also, the transfer made between 1st February, 2018 and 31st March, 2018 will be eligible for exemption under clause (38) of section 10 of the Act. Q 20. What will be the tax treatment of transfer made on or after 1st April 2018 in case of FIIs? Ans 20. As explained in Ans 12, in case of FIIs also, the long-term capital gains exceeding Rs. 1 Lakh arising from transfer of these asset made on after 1st April, 2018 will be taxed at 10 per cent. However, there will be no tax on gains accrued upto 31st January, 2018 as explained in Ans 10. Q21. What will be the cost of acquisition in the case of bonus shares acquired before 1st February 2018? Ans 21. The cost of acquisition of bonus shares acquired before 31st January, 2018 will be determined as per sub-clause (6) of clause 31 of the Finance Bill, 2018. Therefore, the fair market value of the bonus shares as on 31st January, 2018 will be taken as cost of acquisition (except in some typical situations explained in Ans 7), and hence, the gains accrued upto 31st January, 2018 will continue to be exempt. Q 22. What will be the cost of acquisition in the case of right share acquired before 1st February 2018? Ans 22. The cost of acquisition of right share acquired before 31st January, 2018 will be determined as per sub-clause (6) of clause 31 of the Finance Bill, 2018. Therefore, the fair market value of right share as on 31st January, 2018 will be taken as cost of acquisition (except in some typical situations explained in Ans 7), and hence, the gains accrued upto 31st January, 2018 will continue to be exempt. Q 23. What will be the treatment of long-term capital loss arising from transfer made between 1st February, 2018 and 31st March, 2018? Ans 23. As the exemption from long-term capital gains under clause (38) of section 10 will be available for transfer made between 1st February, 2018 and 31st March, 2018, the long-term capital loss arising during this period will not be allowed to be setoff or carried forward. Q 24. What will be the treatment of long-term capital loss arising from transfer made on or after 1st April, 2018? Ans 24. Long-term capital loss arising from transfer made on or after 1st April, 2018 will be allowed to be set-off and carried forward in accordance with existing provisions of the Act. Therefore, it can be set-off against any other long-term capital gains and unabsorbed loss can be carried forward to subsequent eight years for set-off against long-term capital gains.